Leeds Limo Service specialises in Theatre Night Limousine Hire and Hummer Hire for Theatre trips. Click here to call Leeds Limousine Hire. ​How to Book a Theatrical Limousine Experience in Leeds in Just a few minutes. It’s not just Kerri Ellis and Jodie Prenger that deserve the red carpet treatment when they arrive at the theatre, You do too! At Leeds Limousine Service, we feel that Theatre Nights should be treated with the sheer class they truly deserve to make the night feel as magical as the show you'll be watching. What should you expect from Leeds Limos? 1. We Know How to make an Entrance. At Leeds Limos, our Chauffeurs have the local knowledge to ensure that you don’t get stuck in a traffic jam and miss the opening curtain. Whether it’s the West Yorkshire Playhouse, Carriage works or the beautiful Grand Theatre, we promise to get you there on time and with extra time to get a pre-show drink in the lounge. We know all the tricks, and our chauffeurs are professionals at ensuring that you make a Grand entrance on your special night. 2. Perfect Planning Preparation. After giving us your explicit instructions for the night, such as a surprise pick-up for an individual person, you can leave the night to us. We have connections to ensure that you’re not only given a five-star champagne while in the limousine, where you’ll also be treated like a celebrity from the opening of the doors until send off and onto the next venue. 3. No Queuing at the Theatre. Your tickets will be booked with an extra priority on them, so you don’t have to queue; your tickets will be with the chauffeur, so you don’t have to wait in those longs queues at the box office. Everyone will be guessing who you are as you get that famous red carpet treatment they would expect for a star. 4. Final Curtain Call. After watching your chosen show or play you will feel uplifted and even more so when you walk out of the theatre doors to your transport, like in true show business style, a gorgeous gleaming limo waiting to take you to your next destination, like a local wine bar to wind down and talk choreography and pitching, and generally relax in each other. Feel like a West End Star without the West End prices! 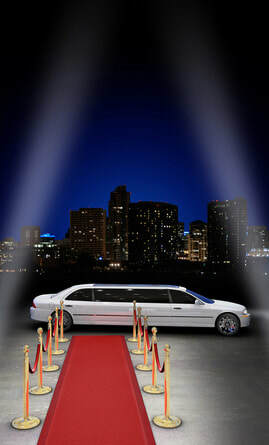 Leeds Limo Service strives for this excellent service to make this an extra eye-popping night for all concerned, so you’ll certainly be the stars on the night. To make this reality, fill in the two-second form on the right-hand side for a ‘No Hassle Guaranteed’ FREE quote. Leeds Limos are proud to offer the best Theatre Night Limousine experience at affordable prices. Or call today on 0113 320 3616 and let's get this show on the road.